Why start with Value Chain? One of the key success factors for adopting a process centric management is the understanding of the overall operation of an organisation as a systemic process delivering values to its stakeholders. A good starting point is the Porter's Value Chain. 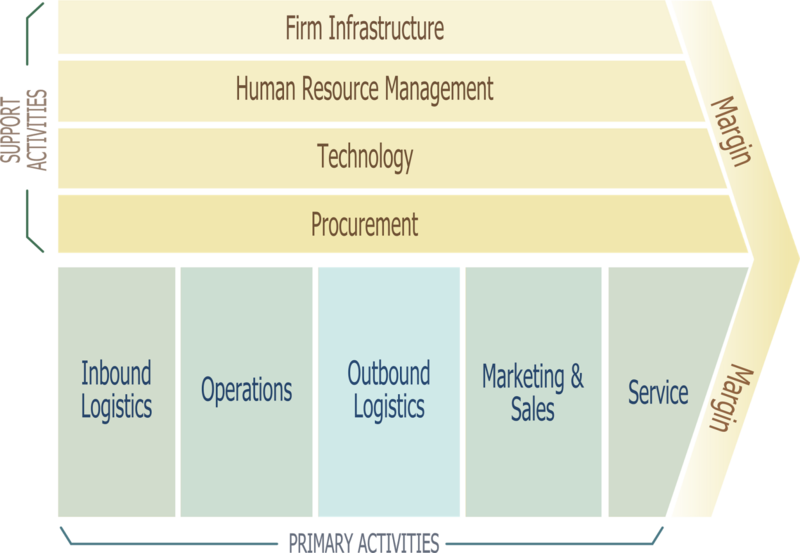 The Value Chain shows the categorisation of business activities that create values within an organisation and delivery of those values to the customer (see Figure). It forms the foundation of having a systemic view of an organisation. It consists of a group of primary activities that delivers the value to the customers while having another group of supporting activities providing various enabling supports to the primary activities. Business process architecture imposes a top-down bird-eye view of an organisation. It renders the landscape view of business processes. Depending on the method adapted, it is sometimes known as the process landscape or a high level process map providing an overall landscape view or map view of the business processes of business operation. 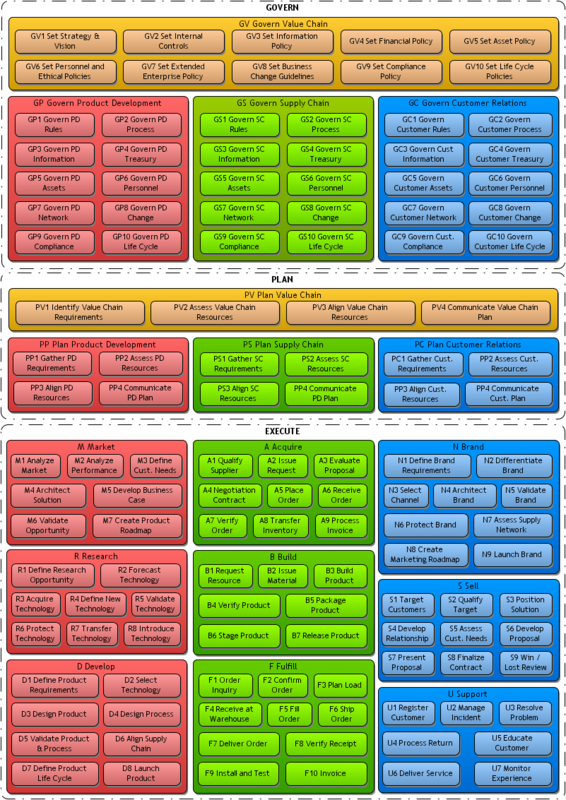 A business process architecture shows the collections of related business activities within specific business functions. The categorisations and groupings depend on the business process framework adopted for creating the business process architecture. You can develop business process architecture from scratch through trial-and-error and drain enormous amount of resource. On the other hand adapting an existing business process framework to build up an organisation’s business process architecture not only save times but present the potential of adopting better practices and faster identification for areas of attention. The following sections provide an overview of some common business process frameworks. APQC PCF is the foundation used by APQC originally for benchmarking of process performance across organisations. It is also now commonly used as a framework to facilitate process management. The framework organises business processes into two areas – operating processes; and management and support services. The Operating Processes include five Level 1 Categories that form the core business activities from 1.0 Develop Vision and Strategy to 5.0 Manage Customer Service. 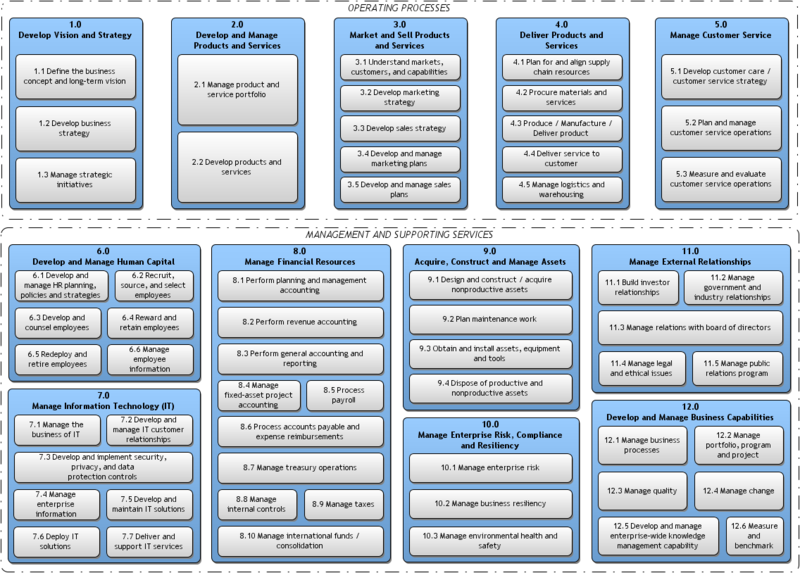 The Management and Supporting Services are the supporting activities (as seen in a Value Chain) including 6.0 Manage Human Capital; 7.0 Manage Information Technology; 8.0 Manage Financial Resources; 9.0 Acquire, Construct, and Manage Assets; 10.0 Manage Enterprise Risk, Compliance, and Resiliency; 11.0 Manage External Relationships; and 12.0 Develop and Manage Business Capabilities. Figure 2 also shows the Level 2 Groups for each of the Level 1 Category. Based on this generic framework, APQC has also developed industry specific frameworks for the major industries. The eTOM is published by the TM Forum which is specifically designed and widely accepted business process framework for the telecommunications industry. Business processes are grouped into three areas: 1.1 Operations; 1.2 Strategy, Infrastructure and Product (SIP); and 1.3 Enterprise Management. 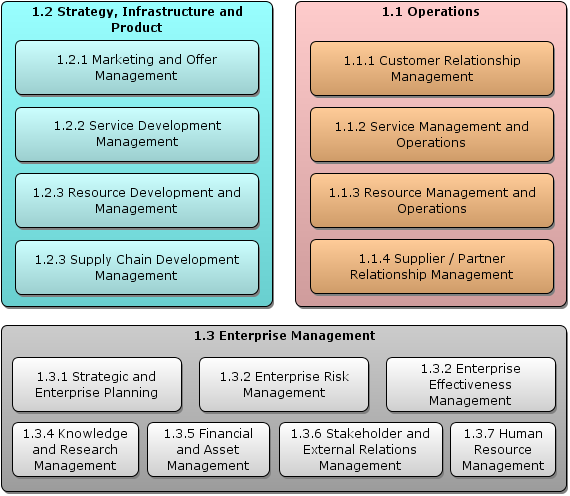 The Enterprise Management area is made up of seven groups. Both SIP and Operations areas include four groups of processes respectively. The model also provides end-to-end business process view (value streams) that flow across the various business functions in the SIP and the Operations areas. There are three value streams within the SIP areas – Strategy and Commit; Infrastructure Life Cycle Management; and Product Lifecycle Management. In the Operations area there are four value streams – Operations Support and Readiness; Fulfillment; Assurance; and Billing and Revenue Management. The SCOR model is developed by the Supply Chain Council. The model is organised around the six primary process groups: Plan, Source, Make, Deliver, Return and Enable. It covers customer interactions, physical material transactions and market interactions. However, as described in its scope, it does not include business activities under sales and marketing, product development, human resources, information technologies, and R&D. Apart from SCOR model, the Supply Chain Council has also published Design Chain Operations Reference (DCOR) model and Customer Chain Operations Reference (CCOR) model extending into other areas of business operations not in the scope of the SCOR model. The Value Reference Model is a business process classification scheme developed by Value Chain Group. Under VRM business processes are arranged into three Level 1 areas – Govern, Plan and Execute. Brand, Sell and Support which align to Customer Relations of Govern and Plan. 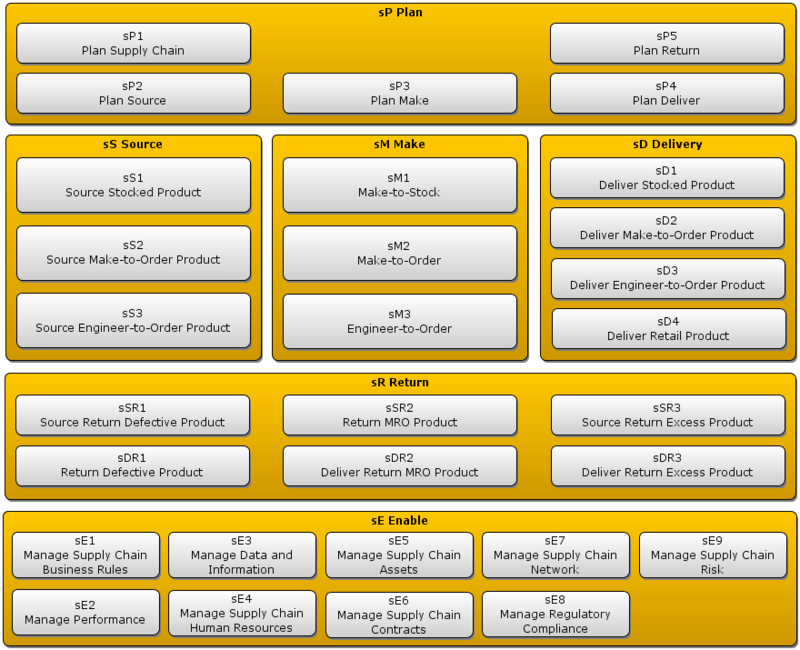 Figure 4 also includes the respective Level 4 business processes. Apart from the industry reference frameworks described in previous sections, there are several business process frameworks and/or reference models developed by the various vendors. Examples include: Accenture Service Line Business Process Reference models and IBM Component Business Models (CBM) and Information Frameworks (IFW). There are also specialised frameworks that are specific to a business function such as ITIL and CoBIT for IT processes and PMBOK and PRINCE2 for project management. Adapting a suitable business process framework or a suite of frameworks to build the business process architecture ensures a top-down intelligence of the business processes across the organisation and not just a siloed view of the trees in the forest. In addition, these frameworks offer standard metrics that can be adapted for measuring of the business process performance. With the given inputs and outputs of each of the standard processes, it is possible to fast track the understanding of end-to-end business processes (value streams) of the business. This is key to identify and determine the core and differentiating activities from the supporting services and allowing business to focus its effort at the right place. At the same time, the adaption of such frameworks opens up opportunity for introduction of standard practices for the supporting activities. Last but not least for the business process modelers, it is the ideal structure for your business process repository and assistance in establishing the relationships between the seemingly loose processes.